Seven decades after its establishment, the United Nations and its system of related organizations and programs are perpetually in crisis. While the twentieth-century’s world wars gave rise to ground-breaking efforts at international organization in 1919 and 1945, today’s UN is ill-equipped to deal with contemporary challenges to world order. Neither the end of the Cold War nor the aftermath of 9/11 has led to the “next generation” of multilateral institutions. But what exactly is wrong with the UN that makes it incapable of confronting contemporary global challenges and, more importantly, can we fix it? In this revised and updated third edition of his popular text, leading scholar of global governance Thomas G. Weiss takes a diagnose-and-cure approach to the world organization’s inherent difficulties. In the first half of the book, he considers: the problems of international leadership and decision making in a world of self-interested states; the diplomatic complications caused by the artificial divisions between the industrialized North and the global South; the structural problems of managing the UN’s many overlapping jurisdictions, agencies, and bodies; and the challenges of bureaucracy and leadership. The second half shows how to mitigate these maladies and points the way to a world in which the UN’s institutional ills might be “cured.” Weiss’s remedies are not based on pious hopes of a miracle cure for the UN, but rather on specific and encouraging examples that could be replicated. With considered optimism and in contrast to received wisdom, he contends that substantial change is both plausible and possible. Thomas G. Weiss is Presidential Professor at the City University of New Yorks Graduate Center and Director of the Ralph Bunche Institute for International Studies. The text has been fully revised and updated to engage with recent developments in contemporary global politics such as the conflict in Syria and the crisis in Libya. An indispensable guide for understanding both the pathology and the promise of the United Nations: love for the UN doesnt come any tougher. 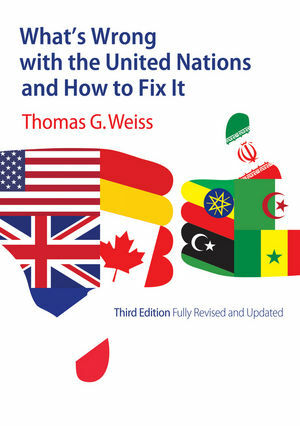 Tom Weiss has been a keen observer and sophisticated analyst of the UN system for decades whose deep expertise is put to good use in this seminal contribution to diagnosing what ails the world organization and prescribing the appropriate remedies. The third edition of this comprehensive and extremely thoughtful analysis by the leading scholar of the UN in the United States should be on the required reading list for the US president, and the leaders of other nations as well.